Single knob offers simple height and tilt adjustment. Durable wood fiber platform with foam wrist rest. Height adjusts 5" (1 1/2" above desk). Allows in-line mouse use on the left or right side. 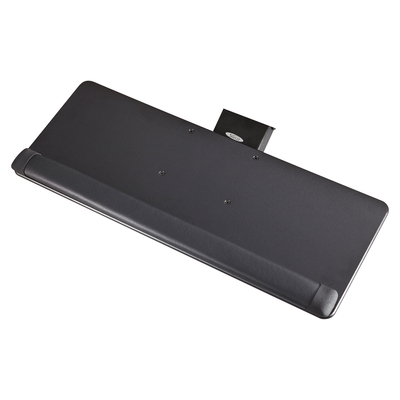 Adjustable Keyboard Platform conveniently tucks away under desk when not in use. Single knob offers simple height and tilt adjustment to ensure comfort and proper ergonomics. Allows in-line mouse use on the left or right side. Height adjusts 5” (1 ½” above desk). Durable wood fiber platform with foam wrist rest.